Funding for councils to build more affordable housing and restoring legal aid for housing advice are needed to solve the housing crisis in Britain, it is claimed. The Labour Party has put forward a number of policy aims relating to affordable homes and helping tenants beat rogue landlords as part of its plan to make sure that everyone has the right to a safe and decent home. The Shadow Justice Secretary Richard Burgon said that the withdrawal of legal advice in many housing cases has weakened tenants’ rights and benefitted rogue landlords. In a speech in Manchester he said that the party will restore legal aid for housing advice which could help up to 50,000 households a year. ‘Prevention is better than cure and this policy will help stop problems like damp, leaking roofs or faulty electrics from spiralling out of control and causing tenants even greater misery,’ he said. ‘The withdrawal of legal advice in many housing cases has weakened tenants’ rights, which can only benefit rogue landlords. Restoring this legal aid for housing advice will help tens of thousands of people resolve their housing issues and regain their housing rights,’ he added. Meanwhile, Labour Leader Jeremy Corbyn, pledged to build enough housing and make sure that housing is affordable to those who need it. At the launch of the party’s affordable housing review he said that if it comes to power it would deliver a million genuinely affordable homes over 10 years, the majority of which would be for social rent. He pointed out that house building has been in steady decline for decades, from over 350,000 a year at the beginning of the 1970s to well below 200,000 today. ‘The only times we have built enough affordable housing is when councils have stepped up. To turn this around will require radical measures to properly fund, empower, and support councils to deliver affordable housing for all,’ Corbyn said. He explained that it would create a new era of social housing, in which councils are once again the major deliverers of social and genuinely affordable housing and set the benchmark for the highest size and environmental standards. 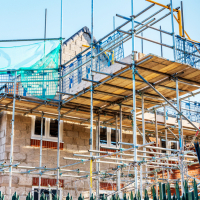 According to Campbell Robb, chief executive of the independent Joseph Rowntree Foundation (JRF), the policy announcement should encourage the current Government to create more affordable homes. ‘Voters across all wage brackets want to see action on housing and it is simply not right that so many people in our country are locked out of the opportunity to build a decent and secure life because of crippling housing costs,’ he said. ‘This recognises the scale of the housing crisis and why we need to drive up the supply of low cost rented homes. It puts pressure on the Government to match this ambition and deliver the low cost rented homes struggling families desperately need. The Government’s forthcoming social housing green paper must commit to increasing the supply of low-cost rented homes in England,’ he added.